I’m attacking the almost year-long overgrown flower garden. Golden black-eyed susans have pushed their way through the taller wild grasses and foxtail. I pull with all I have on the pigweed. When it doesn’t budge, I rip out hands full of clover growing around its base. When the pigweed root is surrounded by exposed and wet-smelling soil, I take my large shovel and hack away at its root. I grunt loudly with each strike, not caring if my neighbors hear me. I talked with Mom today. Twenty-seven minutes exactly. As soon as I’d told her who was calling, she displayed the cruelty of the disease eating her brain. “No, September 3,” I said. I could hear her breathing loudly, thinking through my answer, seeking understanding where none could be found. “Today is Saturday?” she asked. “No Monday.” I hesitated. It’s a holiday Monday, void of the usual Monday routine, a confusing day for the brain fighting to understand while it is having its daily function strangled from it. “Do you see September 1?” I asked. “That’s right.” I praised her. It felt condescending. Does it feel that way to her? Can she tell how far she’s fallen in just two weeks? “Monday, Tuesday, Wednesday, Thursday.” she responded. “Is today Thursday?” she asked then. The strange cruelty of Alzheimer’s: To know right from left and for it to be of no use. To know how to lock your door with a key but to have no idea how to find the doorknob. Alzheimer’s has become a living being, continually growing in its power and cruelty. I sometimes swear at it, realizing I’m actually cursing the man who discovered it. Maybe that’s okay. Maybe we’d all feel better if we didn’t know what was happening. “Today is Monday,” I said. We are 22 minutes into the conversation. Should I have simply said, yes? Would she have accepted the wrong answer and stopped trying then? Could we have talked about something that makes her feel good? That makes her forget for a few minutes that she is not the same as she was just 6 months ago? “I need to sit down,” she said. I heard her movements, her sigh. “I’m in the blue chair,” she said. I heard her breathing. I imagined her trying to formulate her thoughts from her feelings. “Yeah, and she’s right here,” she said. I sighed myself, then. We were onto another topic. One that brings her joy. A minute later she asked me to call her later; she needed to rest. I immediately dress in my cut-off painter scrubs, an old t-shirt and stained sneakers. I need to get my hands around something. I wet a bandana to tie around my neck and go into the humid 89-degree back yard. What’s the sense in it? I ask. I guess I’m talking to God. What’s the purpose in watching someone suffer? Why does she have to suffer while she still understands her suffering? What is there to be gained by that for any of us? I don’t understand it. I’m not meant to understand, I see now…again. I am meant only to keep going. What’s the point of that? I wonder. But still, I hear the point I am meant to know now: that I am to keep going. The ornamental grass I planted three years ago has really taken off. Tall, proud green stalks with golden plumes rise toward the hot sun, growing strong in spite of—or as a result of–its brutal heat. I didn’t take care of the plant properly last fall by trimming the dying stalks a few inches from the ground, and now those dead stalks lie ruined around the plant’s base. I gather the dead grass like straw–it comes up easily when I tug—and I twist and rip it to pieces, watching fragments scatter as they fall on the turned-over soil. What am I taking away from these hard years of watching the dying slowly yield? Is there anything positive to be taken from this? I look again at the dead stalks on the floor of my garden: the dead protecting the potential below it. Maybe something will grow here. Something that gathers strength from the fresh start and the protection of the previously-living lying above it. I don’t know what will grow here. But suddenly I am certain of one thing: Something will grow here. And it will be something good. It will be something strong. Until then, I am simply meant to keep going. Oh my goodness Chris. When I read this I could feel your pain. The pain of seeing your mother deteriorating is cruel and usual punishment. I cried for you. 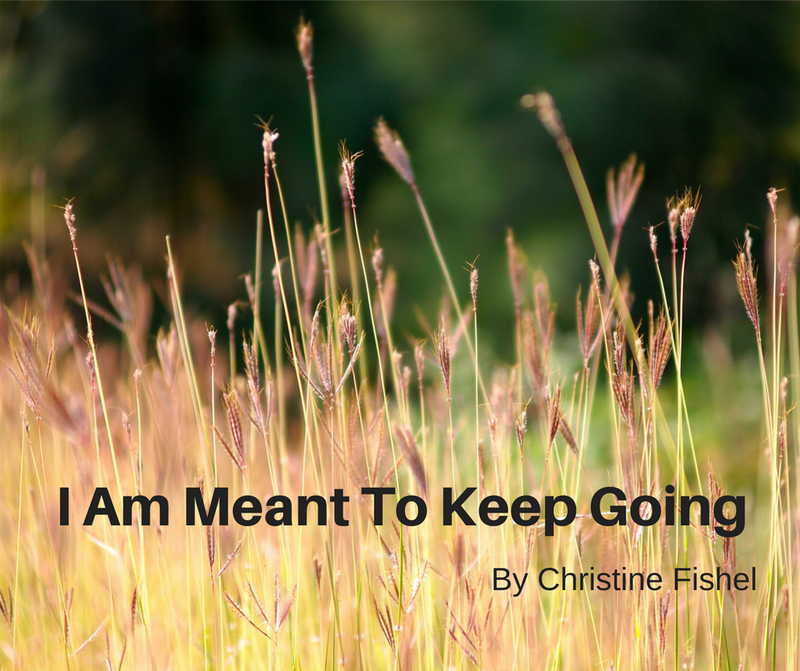 Yes, you are meant to keep going and I will be there for you in any way I can and you need. You are a gift. Your writing is a gift. So many women will relate to this. Always here for you. Thank you for being a part of my village, ME, and for your compassion and love for me. I’m learning that the way out of the pit during these tough times is to share with others. I knew Jesus was with me, even in the pit. I knew my sister was with me, experiencing the same thing. But by sharing what it’s like in the pit, I’ve found a whole village of people who’ve been there too, and just knowing that has been an arm reaching down and pulling me up. Thank you for this ministry that provides the way for us to find each other. Larry, your comment means so much to me! Your quiet and steady spirit has always been inspiring to me, and I’ve often thought “I want to be like Larry.” I’m sorry for your mother’s horrible experience and yours as you had to watch her decline, no doubt feeling helpless as you did. I believe that experience must have given you some of the calmness and gentleness that is now part of you. I hope I learn from this experience as well as you did. I cried thru your whole post. It brought back fresh memories of my mother’s decline thru dementia. 13 months ago, she went to Heaven and I miss her so much! I took care of her for 10 years and I did everything I could possibly do for her while holding down a full-time job. I loved her so much! I hope your mother is doing ok.
Diane, I am so sorry for the pain you have gone through. Losing our mom is so difficult, especially when we watch it happen slowly over years. Sadly, my mom passed away at the end of January. The gift of our experience, though, is that we got to provide mothering for our mothers. And even though it was difficult for them, as it was difficult for us, it is also a beautiful loving addition to our mother – daughter relationship. I am very grateful for those special years with my mom as she declined. I have gone through many emotions in my conversations with God about all of this. And the one consistent thing I know is true is this: He was with me all the time. Thank you for your comment, Diane, and please know that I will pray for you as you go through the coming years.